We are staring at the following in front of us as we prepare for next week’s trading. 1. Our markets made a fantastic bounce back from the budget impact and is moving up consecutively for 3 days. Many people did not expect this bounce back and have missed the upmove. 2. US markets making record highs every day and Nifty is trying to catch up with the Dow. 3. News flow next week – IIP, Inflation, Advance Tax numbers. Markets will be keenly watching the first two news events and take the clue. If the clues are negative, still those who missed this upmove and waiting on sidelines are likely to jump in. So no big fall expected. Interesting point here is that the IIP data – even if it is lower than the market expectations, it will be favorable to particularly sectors like banking which was rallying based on expectations from the Monetary policy review. Lower IIP data would raise the hopes of positive outcome from the review. Inflation – no big expectations. As long as it is around the previous levels and below 7 no big impact on the market. Positional traders could take clues from how your favorite companies are doing based on the Advance Tax numbers which are slated to be out on March 15. March 19, we have the RBI Monetary policy review, markets are expecting 25 points repo rate cut, and is already rallying based on that. As usual, my suggestion is to trade carefully on these news days. Allow the news flow to settle in (most of the announcements come at 11 AM IST) and then look at the charts and trade. In Weekly Chart, Nifty formed a bullish engulfing candle similar to one in June 2012 which marked a major upmove since then. Will there be a similar upmove from now. Very difficult to predict. Depends on several factors including the primary one of Dow. If Dow corrects, Indian markets will fall. 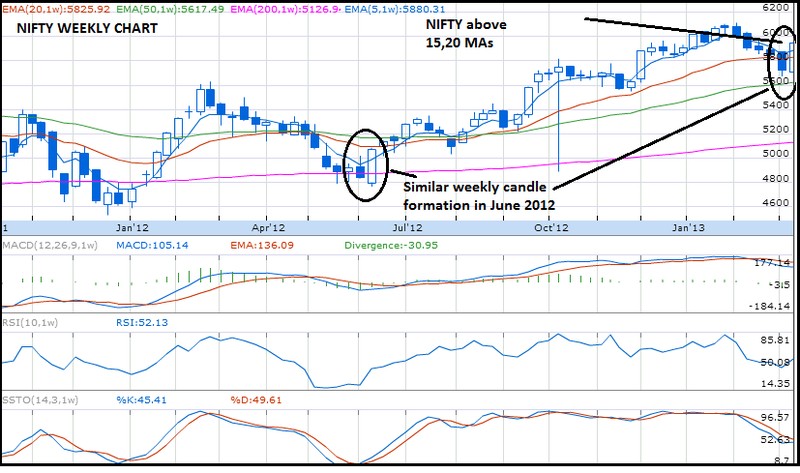 In Daily chart, Nifty made a strong bounce from 200 EMA and started moving up after the budget impact. Nifty closed above 15,20 and 50 days EMA. MACD has given a bullish crossover. 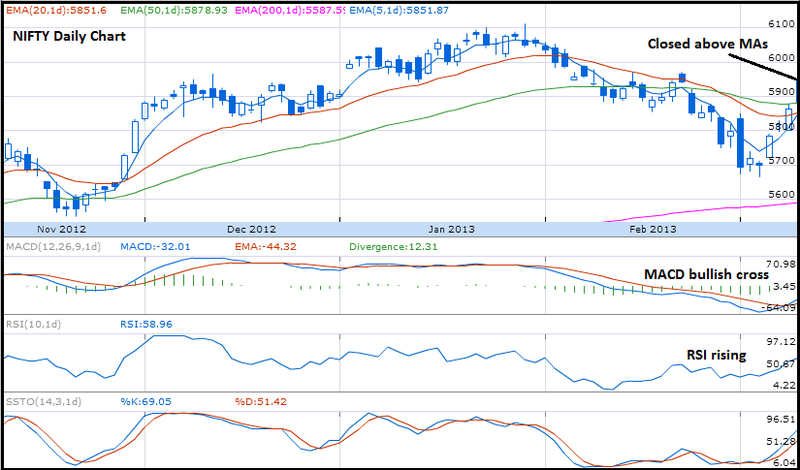 RSI crossed 50 from below. All indicators are not positive, we should see if MAs can make bullish crossovers to confirm the uptrend. Key resistance levels according to me 5975 and 6000. Crossing above 6000 and staying there is bullish. Facing resistance at 6000 and down move will be negative to the markets. Expect a tough battle between bulls and bears in the zone 5975-6000. 5880 is the SL for all longs and market to turn bearish. 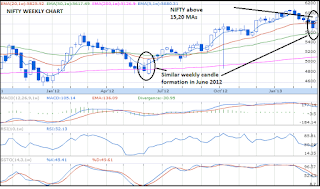 I started covering ONGC in my daily trades, I am bullish on ONGC for next week. Second one is L&T. 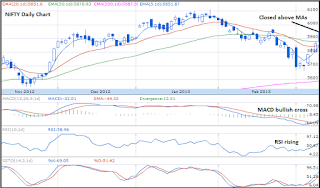 ICICI and SBI – I will still continue to trade on positive side. ITC, BPCL could also move up.